The deal that Obama made with the Repugnikans to extend the Bush administration's tax cuts is a really bad idea. What I find especially unfortunate about the debate over these tax cuts is, very few members of Congress are saying the obvious: why are we even talking about tax cuts when the Federal government is already running a deficit of $1.42 trillion? It seems that both Democrats and Repugnikans have institutionalized the idea of continuing to borrow money from China to keep the U.S. government afloat. I also think it's an outrage that any elected politician, especially the incoming Speaker of the House, would talk about raising the age for eligibility for Social Security to 67 so that rich people can keep their tax cut. You can help keep this ad on the air by clicking here. My mother Elizabeth passed away in her sleep after a brief illness on November 22, 2010, at the age of 90. Elizabeth was born and raised in Bloxom, on Virginia's Eastern Shore. Her ancestry there dates back to the late 1600's. Her father, Stanley Lewis, was a gregarious and well-respected person. He owned a store during the Great Depression, and was willing to extend credit to customers who were having hard times. The family had some land, and Elizabeth was able to earn some spending money by collecting eggs and selling them. She had excellent grades in school, and was able to pursue higher education at Virgina Intermont College in Bristol, VA (a women-only junior college at the time) and earned a Bachelors degree at the University of Mary Washington in Fredericksburg, VA in 1942. This was the start of a very long teaching career, which started in Newport News, VA during World War II. There, she met her husband, Henry, and William Styron, author of Sophie's Choice. Elizabeth and Henry settled in Fredericksburg, and Elizabeth proceeded to become an institution, teaching sixth grade a Maury Elementary. She later moved to the Fredericksburg Middle School, then, when she was in her 50's, earned a Master of Education from the University of Virginia, in 1973. She finished her career as a guidance counselor in Loudon County, VA.
Elizabeth's life spanned most of the 20th Century. (She had an uncle who was a victim of the great flu epidemic that took place in Europe in the aftermath of World War I.) The house that I grew up in outside of Fredericksburg had some land that was used for raising beagles and an assortment of fruits and vegetables. I have early memories of Elizabeth and the neighbours getting together and canning preserves, using wax as a sealant. This is an art that was lost for a while, and is now making a comeback. Another common activity was making ice cream, using a hand-cranked device containing ice with the temperature lowered with rock salt. Elizabeth was active in the local garden club for a while, and she and Henry were avid bridge players. Because of the value that she placed on education, there never was any doubt that my brother and I would continue our education beyond high school. I got a BA degree from Virginia Tech, and Bill got a BA from William and Mary, and a law degree from the University of Miami. Elizabeth and Henry retired in the mid-1970's, and made very good use of their time. They travelled extensively in Europe and North America. They spent a month on Mallorca. Elizabeth especially enjoyed a couple of trips to Hawaii. She paid me a visit when I was living in Oslo, and fulfilled a long-term dream of travelling on Norway's Hurtigruten, a ferry that traverses the west coast. In 1987, Elizabeth and Henry decided that they wanted to spend more time with their granddaughter, Darcy. So, they sold their house in Front Royal, loaded up the Buick, and moved to Bremerton, WA. This was a very positive step for Elizabeth. She was a huge help in raising Darcy and two more grandchildren, Jacqueline and Michael. She also helped many more local children learn to read. 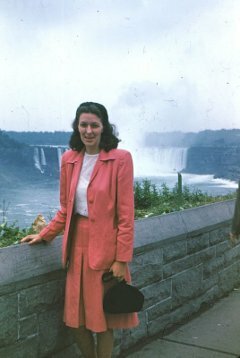 She participated in many elderhostels in the Pacific Northwest. The last two years of her life were not very pleasant. She was wheelchair-bound, and lost Henry and both of her sisters, Violet and Nancy. Even so, she never lost her appreciation for a good latte, one of many interests I share with her. She was an avid reader for all of her life. She was a huge influence in my life, and thousands of others. The Province columnist Jon Ferry wrote a worthwhile column about the future of Amtrak's Seattle-Vancouver service, Foot-dragging feds slow train service to Seattle. A target of four trains a day is entirely reasonable. Long before Amtrak existed, Burlington Northern (now known as BNSF) was running four trains a day between Seattle and Vancouver, at a time when the population in the Tacoma-Seattle-Everett-Mount Vernon-Bellingham-Vancouver corridor was much lower. The actual mover and shaker for the existing service is actually the Washington State Department of Transportation; Amtrak runs the service under contract. WSDOT has started talking about a third daily train. I hope that they at least take a look at an overnight Vancouver-Portland train, with sleeper cars. The idea would be to reduce the demand for plane flights in the corridor. If market studies show that there's no demand for this, OK, but at least do the studies. Ferry mentions running high-speed trains via Abbotsford instead of White Rock. This is the first I've heard of this. Running high-speed trains around Crescent Beach certainly doesn't make any sense, but BNSF's long-term plan is to create a new set of tracks running east of White Rock. 1. This mosque is not at Ground Zero. It is two blocks away. 2. This project, officially known as the Cordoba Initiative, is a lot more than a mosque. It will be 13 stories, and includes a performance-art center, a gym, and a swimming pool. 3. The person behind the Cordoba Initiative is Imam Feisal Abdul Rauf, who is the founder of the American Society for Muslim Advancement. He is the Imam of a mosque in Manhattan that is 12 blocks away from Ground Zero. The stated objective of the American Society for Muslim Advancement is to bring Muslims and non-Muslims together through programs in academia, policy, current affairs and culture. 4. Michael Bloomberg, the Mayor of New York, is Jewish and Republican, and he has no problem with this project. So why do you have a problem with it? 5. Iman Feisal has as much right to put up a religious centre on Manhattan as you have to put one of your churches in my neighborhood. If you have a problem with this concept, take it up with little Mormon boy Glenn Beck. Here is an account of several International Day Against Stoning events: Worldwide Protests in Support of Sakine Mohammadi Ashtiani and Against Stoning and Execution. Op-ed piece by Irwin Cotler, published in the Vancouver Sun: Iran is more than just a nuclear threat. Cotler is a former minister of justice and attorney-general of Canada. He makes a very strong case for an end to enabling the behavior of the Ahmadinejad regime. Pakistan (allies of the U.S. and Canada in the war in Afghanistan) has sentenced a man and woman to death by stoning for adultery. Here's a story by Saeed Shah in The Guardian: Pakistani couple face death by stoning threat after conviction for adultery. I learned a couple of days ago that Sunday, July 11, is the International Day Against Stoning, and protests against this barbaric practice are taking place in at least Washington, DC, Beverly Hills, CA, London, and Sydney, Australia. The obvious question that this raises for me is, why is it that in the Twenty-First Century, we have a need for such a thing as an "International Day Against Stoning"? Throwing rocks at human beings to put them to death, for "crimes" such as "illicit relations", is something that I learned about in Sunday School. It gave rise to one of Jesus' best known quotes, "He that is without sin among you, let him first cast a stone at her." This was two thousand years ago. The creatures who don't have any problem with casting the first, second, or third stones now live in Iran, Pakistan, Somalia, and Nigeria. I'll write about Pakistan first. I've recently read two books by Greg Mortenson, Three Cups of Tea and Stones Into Schools. I recommend both of them highly, especially Three Cups of Tea, but if you don't have time to read a book, you can watch this video of an interview of Mortenson by Bill Moyers of PBS. Mortenson's low-cost efforts to build schools in Pakistan and Afghanistan have done far more good than the billions of dollars spent on bombs in that part of the world. If you've been paying any attention at all to events in Iran over the past 30 years, you know that the country is governed by religious fanatics who call themselves Shiite Muslims. You know that Iran has a president who denies that the Holocaust happened. He went to New York City and claimed that there are no Gays among Iran's 74 million people. He wants Iran to develop nuclear weapons, but keeps lying about it. Now, who is enabling Ahmadinejad's behaviour? Two people who are doing it are Hugo Chavez, President of Venezuela, and Daniel Ortega, President of Nicaragua. So, if you consider Chavez and Ortega to be friends of yours, it's time to find yourself some new friends. One-half of Iran's government revenue (remember, this article is about the goverment of Iran that stones people for "illicit relations") comes from oil exports. These exports go to Japan, China, India, South Korea, Italy, Spain, Greece, France, and South Africa. If you drive a car, or ride a bus or plane in any of these countries, you're enabling the behaviour of the Iranian government. If you live elsewhere, you can show your support for the International Day Against Stoning by placing a rock in a public place. University of Victoria Professor Andrew Weaver has launched a lawsuit against the National Post, Terence Corcoran, Peter Foster, and Kevin Libin. It's about time. The National Post columnists stated that Weaver is a "corrupt scientist". They claimed that he fabricated stories about a break-in into his office. Weaver did no such thing. His office was indeed broken into, and there is a police report to prove it. However, Weaver never made any accusation with regard to who was responsible for it. Why, then, did it say in the National Post, not once but on four different occasions, by three different authors, Corcoran, Foster, and Libin, that Weaver had accused the fossil fuel industry of being responsible for the break-in? Because the National Post prints lies, that's why. The editors and management of the National Post know that Terence Corcoran is a liar, but they keep him on the payroll, and don't fact-check his stories. Here's a couple of examples. On February 3, 1997, Corcoran wrote a piece for the Globe and Mail that stated that the Non-Smokers' Rights Association (NSRA) had used money from public funding to attack tobacco-industry-friendly politicians. The NSRA did no such thing, and the NSRA sued the Globe and Mail and got an apology and a settlement. In April, 2001, Corcoran, now writing for the National Post, wrote that the British Columbia government "prohibits raw log exports except by exceptional permit". No, it doesn't. Permits are required only for exporting logs from Crown land. Raw log exports tripled in 2000, the year prior to when Corcoran made this false statement. Weaver is being represented by McConchie Law Corporation in Victoria. Here's their press release: Climate Scientist Sues National Post for Libel. Weaver's suit also intends to hold the National Post responsible for libelous comments posted on their web site. If you have other examples of lies told by Terence Corcoran, Peter Foster, or Kevin Libin, send me an email, or post a comment to this article. I'll add them to the list here, as well as forward them to McConchie Law Corporation. The idea here is to convince a judge that apologies and retractions have been insufficient in making these liars change their behaviour, and they need to be hit harder in the pocketbook.